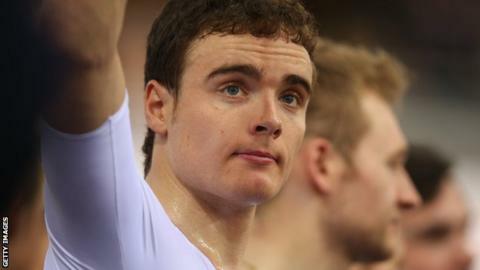 Steven Burke is a doubt for this year's Track World Championships after breaking his collarbone in a crash at Britain's training camp in Majorca. The 26-year-old was in the victorious team pursuit quartet at London 2012 and was preparing for the Worlds, which begin on 18 February in Paris. Burke said: "I'm disappointed but I've been in the gym today. "I aim to be back on the track as soon as possible so that I can resume training for the World Championships." Team-mate Owain Doull fell in the same incident, but the Welshman only suffered minor injuries. "The accident on Sunday was unfortunate, particularly as Steve had been showing some great form of late," said technical director Shane Sutton. The pair are also in Sir Bradley Wiggins' new team, working with the Tour de France winner ahead of the Rio 2016 Olympics. Ed Clancy, who was also part of the team pursuit team who won Olympic gold in a world record time in 2012, is joined by Andy Tennant, Mark Christian and Jon Dibben as the other riders in Great Britain's track endurance programme.